If you have Windows XP installed on your PC then you might have faced this annoyance. Whenever you click on a folder in the left pane of Windows Explorer, it expands the folder and also shows it’s contents in the right window pane. You might be annoyed with this as you might just want to be able to navigate down the tree with out any folders expanding. Now if you have lots of sub-folders inside a folder and you are trying to find something quickly, you have to wait a while for each folder to expand. It can be quite time consuming. 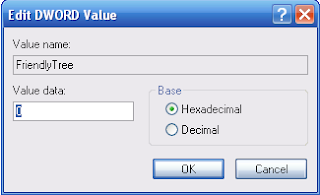 To disable auto expanding from the Control Panel in XP – click on Start > Run > Control Panel then double click on Folder Options. 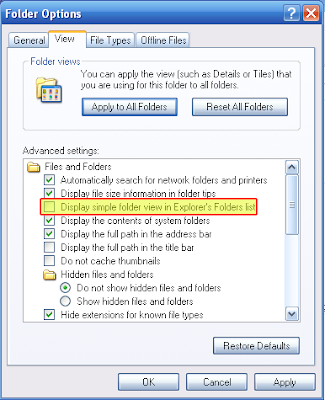 Select the View tab and under the “Advanced Settings:” section, uncheck Display Simple folder view in Explorers folder list and click OK.
Open registry, click press Windows Key + R.
Enter “regedit” in the run box and press enter. After making any of these changes, automatic expansion of sub folders will be disabled. Expanding a folder can now be done by double clicking the folder or clicking on the plus icon.